The articles published in Molecular Enzymology and Drug Targets have been cited 8 times by eminent researchers all around the world. 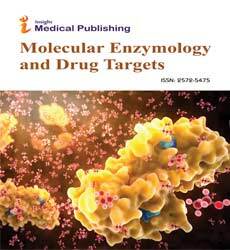 Following is the list of articles that have cited the articles published in Molecular Enzymology and Drug Targets. Takahashi S, Sugimoto N (2016) Volumetric contributions of loop regions of G-quadruplex DNA to the formation of the tertiary structure. Biophysical Chemistry. Behzadi P, Behzadi E, Ranjbar R (2016) IL-12 family cytokines: General characteristics, pathogenic microorganisms, receptors, and signalling pathways. Acta microbiologica et immunologica Hungarica.63: 1-25. Ranjbar R, Behzadi P, Mammina C (2016) Respiratory Tularemia: Francisella Tularensis and Microarray Probe Designing. The Open Microbiology Journal. 10:176. Mohseni N, Sarvestani FS, Ardestani MS, Kazemi-Lomedasht F, Ghorbani M. Inhibitory effect of gold nanoparticles conjugated with interferon gamma and methionine on breast cancer cell line. Asian Pacific Journal of Tropical Biomedicine. 29:173-8. Mohseni N, Sarvestani FS, Ardestani MS, Kazemi-Lomedasht F, Ghorbani M. Asian Pacific Journal of Tropical Biomedicine. Choi J, Kim MG, Oh YK, Kim YB (2017) Progress of Middle East respiratory syndrome coronavirus vaccines: a patent review. Expert Opinion on Therapeutic Patents. 27: 1-1. Kandeel M. The sodium/glucose co-transporter inhibitors are a growing repository for treating diabetes. ARCHIVOS DE MEDICINA. 1: 2. Kandeel M, Altaher A, Kitade Y, Abdelaziz M, Alnazawi M, Elshazli K. Evolution of camel CYP2E1 and its associated power of binding toxic industrial chemicals and drugs. Computational Biology and Chemistry. 31: 271-80.